Here is a delicious recipe sent to us by reader and blogger Robyn Huffman who blogs over at Adventures In Abbyland. If you need a quick and easy chicken recipe for your slow cooker look no further than this Crock-Pot Garlic & Herb Chicken. 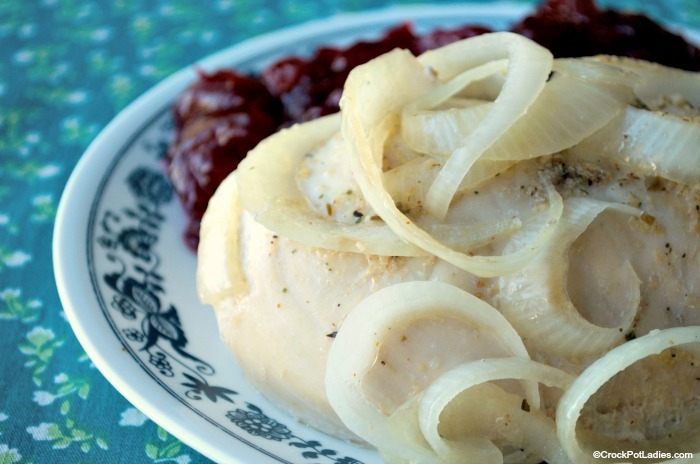 Boneless skinless chicken breasts are tossed in the slow cooker along with some onion, water, butter, McCormick Perfect Pinch Garlic & Herb Seasoning, cooked. We LOVE that this recipe uses frozen chicken breasts. Because let’s face it, some days you just don’t have time to thaw meat! However, if you have thawed chicken breasts we give you cooking instructions for that too! You can serve this chicken with whatever your favorite side dish for chicken is. We served it with some canned cranberry sauce. But mashed potatoes, zucchini casserole, or even rice would be great with it too! Finally, you can prepare this meal up to 24 hours in advance. Simply place all of the ingredients in a gallon sized food storage bag and store it in the refrigerator. When you are ready to put it in the slow cooker just dump everything in and turn it on to cook! That means even your spouse or older kids can get dinner cooking if you are at work or out running errands! Thanks Robyn for the great recipe! With just 5 ingredients (we don't count salt and pepper) this chicken recipe has great flavor and is super simple to make. 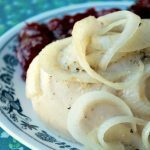 You can use frozen chicken breasts in this recipe, making it great for days when you don't have time to thaw out meat! 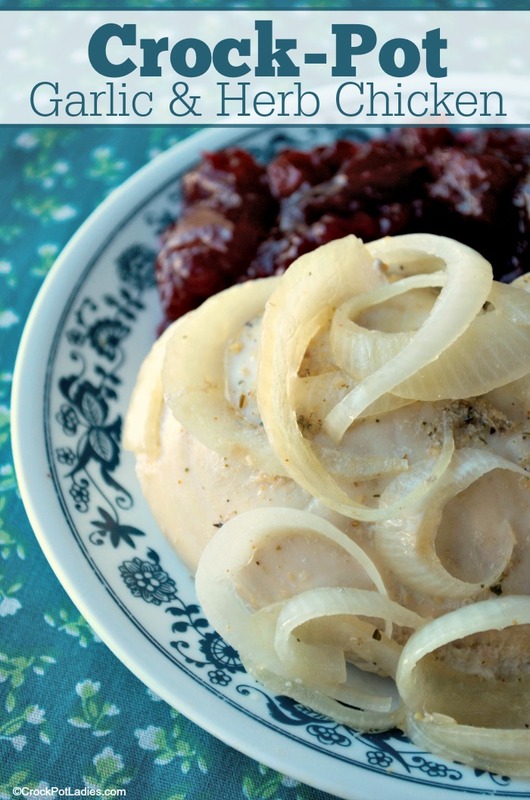 Place the frozen chicken breasts in a 4 quart slow cooker. Add the sliced onion, water, butter and garlic and herb seasoning to top of the frozen chicken breasts in the slow cooker. Cover and cook for 4 to 5 hours on HIGH or until chicken registers 165° F on an instant read meat thermometer. Season cooked chicken to taste with salt and pepper (if desired) and serve with your favorite side dish and enjoy! We do no recommend cooking boneless skinless chicken breast on the LOW setting for longer periods of time as they tend to dry out. That being said you can cook this chicken on LOW for about 6 to 7 hours. But check your chicken at the 6 hour mark and if it is done stop cooking it so that it doesn't dry out from overcooking. If you are starting with thawed chicken breasts reduce the cooking time by about 1 hour (so in this recipe 3 to 4 hours on HIGH or 5 to 6 hours on HIGH). Nutritional information is based on all ingredients except salt and pepper. If you add salt you will need to adjust the sodium content of this recipe. 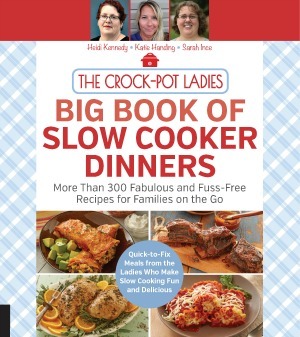 Love using my crock pot!